I love it! It was only $15 dollars at Sam's Club. It's pretty big -- 23" x 36". It's also magnetic and the reverse side is a memo board. They are fabulous. 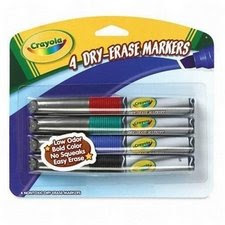 They don't have the strong odor that gives you a headache like the other markers do. Plus there are four colors to choose from. 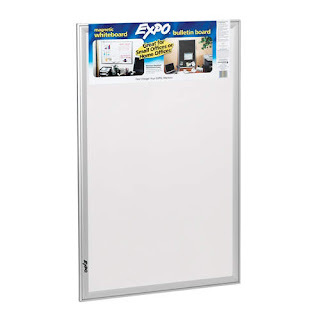 We also use our white board like a flannel board, except with magnets. We have all sorts of stories, games and songs that go up on the board. And I found this magnetic tape that works perfectly for that purpose. I love this stuff. 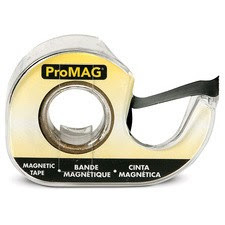 It's just like tape, but magnetic. It's nice and thin so it keeps all my "magnetic board" stories flat and compact. It lasts a long time too. And because I promised my sister I would--stay tuned for some magnet board activities. Where do you get your tape? It looks a lot easier to use than the magnetic strips I buy. I've seen the magnetic tape at JoAnns and at Michaels. I get it at Michaels because it's half the price there than what it is at JoAnns. With my 40% off coupon I get it for around $2.